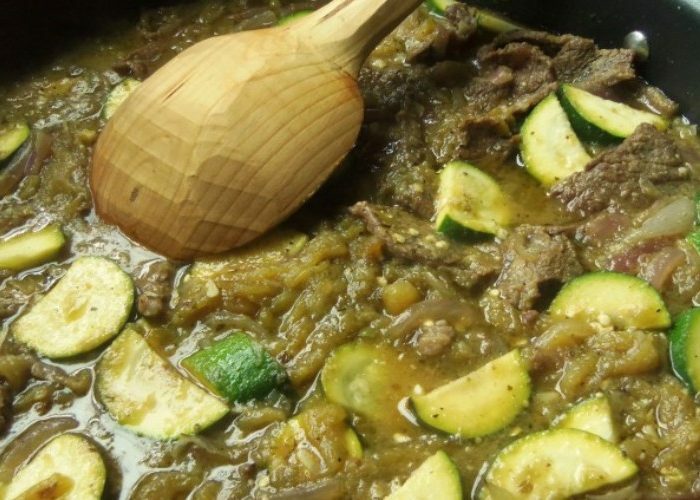 Roasted green chiles slow simmered with thin-sliced beef chuck and fresh zucchini in a tomatillo broth. 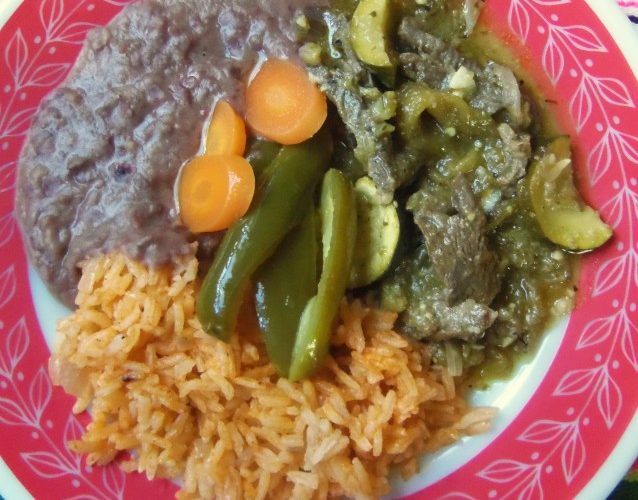 Beef Chile Verde, typically a slow-braised meat, is one of those dishes that you can cook low and slow on the stove top or in the Crock Pot. It fills your home with the aroma of those home-cooked meal like Mom would make. The variations on how to cook a carne guisada are endless. Start with your favorite cut of meat, sliced thin. 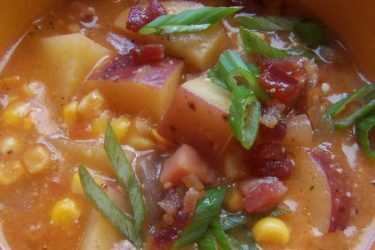 Decide on what aromatics and vegetables to add. Then finally pick a sauce for the base. I love both red sauce and green sauce-based guisados and especially any that combine roasted green chiles with tomatillos. For this recipe, I start with thinly sliced chuck steaks, add flavorful roasted green chiles and just enough tomatillo salsa to bring it all together. Trim excess fat from chuck steak and slice thin. Mix 1 teaspoon each of salt, pepper, garlic powder, cumin and oregano. Season beef all over. Squeeze on lime juice and drizzle with olive oil. Set aside. Remove skins, stems and seeds from cooled roasted green chiles. Slice them into thin strips and set aside. In a large skillet, add 2 tablespoons of olive oil and preheat to medium/high heat for a few minutes. When oil is hot add the beef. Cook and sear on all sides, tossing as needed. Cook until any liquid evaporates. 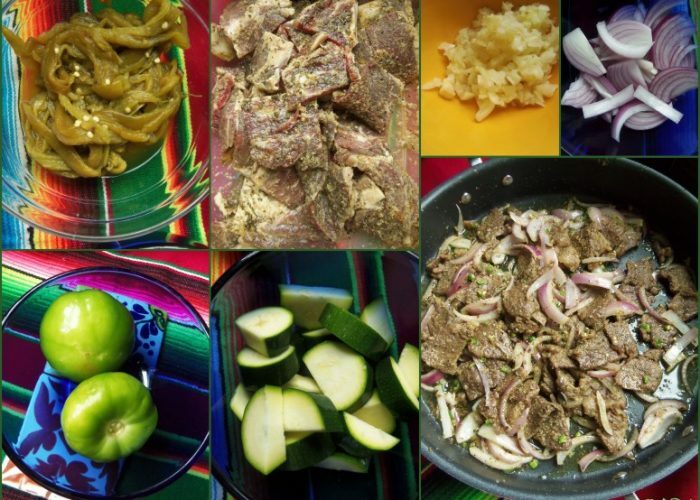 While beef is cooking, add the tomatillos and 1/2 cup of water to a glass bowl. Cook on high in the microwave for 5 to 6 minutes. Remove from microwave and transfer to the blender, including all the liquid. Season with 1/3 teaspoon each of salt, pepper, cumin, oregano and garlic powder. Blend on high until smooth. Set aside. Move the seared beef over to one side of pan. Reduce heat to medium. To the empty side, add the onions, garlic and serranos. Saute for 2 minutes then combine with beef. To the skillet, add the green chiles, salsa from blender and Maggi or Worcestershire sauce. Stir well to combine, reduce to a simmer and cook for 5 minutes. If it seems too dry, add in a little more water or broth. Fold in the zucchini and cook for another 6 to 8 minutes. Yields up to 6 servings. 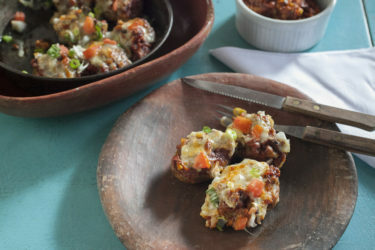 Serve with rice, beans and warm tortillas. To roast fresh green chiles. Roast in a 400-degree oven for 20 minutes, turning halfway through. Place in plastic bag until cool. The green chiles are labeled as Anahiem, New Mexico or Hatch peppers. 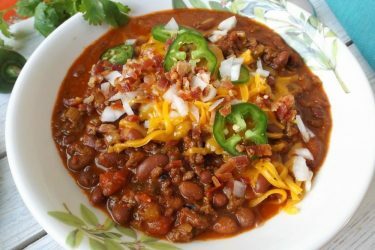 To substitute canned green chiles for the fresh, you will need about 16 ounces.